News - Metric featured in CNC West article. 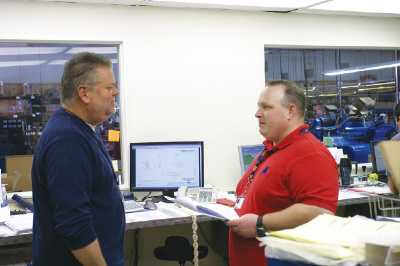 Metric Machining deploys its new ERP system and CNC West talks about it in a recent article. to Totally Integrate Internal Systems from Quoting to Delivery. 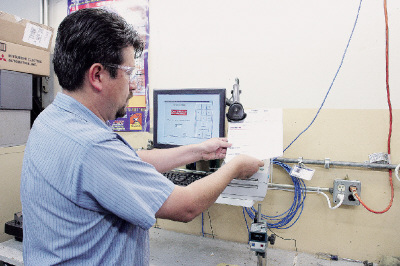 CNC leadman Rafael Quiroz uses a bar code scanner linked to a live Wyse terminal, which, in turn is linked to the company’s central server. Data goes into and comes from Visual EstiTrack which automatically tracks job costs, machining time, etc. The operators need only to enter the number of parts made, which significantly improves accuracy of job cost reports. Okay, suppose you’re the number two person on a new management team assigned to get control of a very successful, 38-year-old screw machine job shop with 94 employees producing millions of parts a year. Also, suppose when you get there, you find that all the internal systems essentially use 1980’s technology, which means manually produced spreadsheets for quoting, job costing, tracking, reporting, inspection, packaging, shipping and customer relations. You discover that the reports you receive are full of errors or come in too late to help make timely decisions. What would you do? The company? Ontario, CA’s Metric Machining, Inc. The management team? Dave Parker, new president and son of the company’s founders Richard and Joan Parker. Second man on the team is Tim Shuell, vp, who was asked by Parker to come in and help get things going 21st century style. Shuell, who has years of experience as an entrepreneur running his own business, in management at other screw machine companies, and as a business consultant, shakes his head a bit when he considers what was going on. “Metric was very organized,” he says. “It had systems, but none of them really took advantage of today’s technology. For instance, on the quoting side. You had a spreadsheet that could only capture a limited amount of information and had to be manually transferred to the manufacturing software. The more manual transfers required, the more your exposure to human input errors.” The whole system was very labor intensive, Shuell says. Shuell had been involved with and solved such problems before as part of his previous life as a consultant. As a result, he didn’t have to go on a major search to find a software package to meet their needs. He already had the answer right at his fingertips. their new workbench design in the quality control department. How did the system speed up inspection? The Visual EstiTrack system went live at Metric on October 25, 2010. Another reason Visual EstiTrack is so effective, is because the Hennings people hold annual conferences to ask their customer what needs to be repaired or improved, Shuell says. “No matter how long you use this software, I don’t think you can ever find an end to the features that are in it,” he says. “I’ve used it for almost eight years, and I’m still finding new things in it. It’s just blows your mind sometimes.” And what about those 17 pieces of paper?